When Two Fisted Tales first hit the presses in the 1950s, comics were the medium of choice for kids all across North America. They came after radio, but before television was a common household item, and so held the attention of young people as something new and exciting, all for 10 cents a copy. Although the art was often very good, the writing was largely composed of short, campy stories with horrible dialogue. The artistic layout as well (including the interplay between the images and their captions) had yet to really mature. 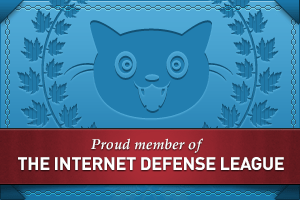 Issue # 25 is used on Wikipedia and in other sources to exemplify TFT’s ‘anti-war’ leanings. The soldier on the left comes running, yelling, “Guys! I just got word they’re arranging an armistice!” His comrade answers back, “Yeah! Yeah! Tell Jonesy here about your armistice! He’ll be glad!” The third soldier, to the right, lies face-down in mud, recently killed. Just to put this into perspective—Hollywood had yet to barely begun showing dead bodies in war movies. 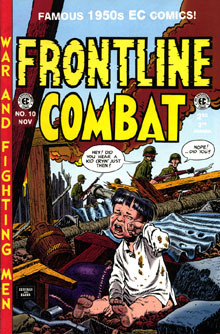 Putting one on the front cover, of a kid’s comic, during war-time, in a way that questioned the price of war, was largely unique. It’s really difficult to sum up Harvey Kurtzman’s life, and how it influenced such a leap forward for comic books, but it’s impossible to talk about TFT without him. Although his career began earlier, he is largely credited with the success of Two Fisted Tales and its companion comic, Frontline Combat, as the editor of the pair. In this time, he also went on to be the founding editor of MAD Magazine, among other projects. The contribution MAD has made in comedy cannot be overstated. Some have even suspected that it’s impossible to think of anything within American satire today that hasn’t somehow been influenced by MAD, and therefore, by Harvey Kurtzman. That being said… what made Two Fisted Tales a good political comic? And Harvey a good writer? Kurtzman was drafted in 1943, but he never did go overseas. I mention this, because if he had in fact seen combat, I would have more easily attributed his qualitative difference with what he may have seen/experienced in war himself. Since this isn’t the case, then we might conclude that even more influential than his time in service was his liberal/radical upbringing (his step-father was a staunch trade-unionist, his mailbox the receiver of the People’s Daily World of the Communist Party.) Kurtzman never considered himself a socialist or communist, but he had made his opinions clear on several occasions about war, racism, and religious intolerance. Still, accuracy does not indicate political leanings–just honesty. Saving Private Ryan wasn’t an ‘anti-war film’, even though it was arguably the most accurate depiction of war in film when it was released. …So is Two Fisted Tales “anti-war”? I agree with Peter in that these were not “anti-war” comics per se in their agenda—but they were anti-war as a result of their accuracy. This again goes back to the type of person Harvey was. I will also add that it falls into Harvey’s habit of not being categorized easily. As a political comics enthusiast, I have yet to find a good ‘political’ comic that placed a political agenda before the telling of the story, and I think Harvey understood that well, having worked with comic artists who published everywhere from Marvel to the communist party newspaper. To begin, you create uncompromisingly, and in doing so, you largely defy (or re-define) categorization in your work. … And yet, perhaps it was even a little bit more than that. I quoted Harvey earlier speaking to a certain “responsibility” in children’s literature. It is possible that Harvey felt a responsibility to show young people an opposing view of war as well as history (including Custer’s Last Stand and The Alamo—not how you learned them in school, kids!). That’s not just a strive for accuracy; that’s pro-actively seeking out an improperly remembered event or ‘hero’ of American history, and trying to set the story straight. In my opinion, that makes Two Fisted Tales not just an anti-war comic relatively speaking, but anti-war and political at its core. Whether you see it as a bittersweet rite of passage or as a cannon fodder-drive for the imperialist war machine, there is no denying that war is a horrible thing. And sometimes telling it like it is will be enough to set you aside from everyone else. It was a bit of star-crossed fortune that Harvey made TFT at the time that he did… everyone had their gaze fixed so tightly on Hollywood films as the next big medium that comics fell under the radar as an unsophisticated business of “kids’ books”. As such, comic book writers had more freedom—intellectually and politically—to spread their wings. If Two Fisted Tales had been a TV or film series, you can bet Harvey Kurtzman would have been thrown into some Red Scare kangaroo trial. And the world would have been shorted a creative genius.